In some respects, official websites or virtual government buildings are similar to brick-and-mortar ones. Both types have to be accessed and visitors need to look around to find the right office. But that’s where the comparison ends. Traditionally, government buildings have been imposing, permanent structures. In contrast, the fate of digital buildings tends to be short-lived and dependent on election outcomes. Public agencies have reason to be concerned about their websites. “Citizen satisfaction with government services is low and declining.” A decline of satisfaction from 2012 to 2013 by two points is largely attributed to “deterioration in satisfaction with government websites.” These findings are from the report, “Serving Citizens. Strategies for Customer-Centered Government in the Digital Age,” published in 2014 by the Partnership for Public Service and Accenture. Satisfaction is measured by the widely used American Customer Satisfaction Index. The report compares websites that present confusing information using the bureaucratic structure as organizational principle with websites that provide informational pathways for major user groups, such as businesses or veterans. Why the attention to detail? In the physical world, government buildings and the surrounding landscape can leave an impression on visitors, good or bad. The same holds true in the virtual world. An inviting and thoughtful digital presence may attract businesses and jobs. Curb appeal, however, is not enough. The inside pages require equal attention and a team should be assembled that is up to the challenge. The Phoenix Checkbook provides residents with information about the city’s expenditures – your tax dollars at work! Residents can review city purchases. The database is searchable by department or vendor. Payments can be viewed online with drill down capability and downloaded as a report or Excel spreadsheet. The searchable database is updated monthly. With this transparency, the city holds itself accountable and keeps fraud in check. The City of Phoenix is also known for its satisfaction surveys. Since 1985, Phoenix has conducted systematic surveys of residents and city employees. The findings improved over time, and in 2013 the resident survey found that 93 percent of respondents felt Phoenix was a good place to live. Again, posting the results on its website, the city improves transparency and accountability. The regular surveys suggest that the city strives to be a learning organization in Peter Senge’s sense (see column 5) and one is tempted to argue that the city offers models for benchmarks and best practices. A website is pretty much a one-way form of communication. In contrast, social media offer two-way forms of communication and the sharing of information over multiple channels. The use of social media by governments is a relatively recent development. A survey, conducted by the International Public Management Association for Human Resources (IPMA-HR) in 2013, found that only one-third of respondents used social media in the hiring process. Which social media platforms should the jurisdiction and individual agencies adopt? What content will be relevant for internal or external stakeholders? Who should have the right and responsibility to participate in the exchanges? What should be included in a comprehensive social media policy? The social media universe is constantly changing; but Twitter, Facebook, YouTube and LinkedIn are among the most important platforms for the sharing of professional information in the form of text, photos and videos. The content depends on the work of each office and the types of communication partners — fellow employees, subordinates, superiors, elected officials, the press or various publics. One agency, often the office of public relations, may oversee setting up the platforms and managing them in collaboration with experts from information technology, human resources and other staff and line agencies. The U.S. Office of Personnel Management adopted a social media policy in December 2012, which is quite comprehensive and useful. IPMA-HR has become a depository for sample policies and for the exchange of Q&A. The ownership and use of smartphones require a policy as well. For example, the City of Chandler, Arizona issues a city-owned smartphone or employees can get an allowance for using their own. The federal government adopted a “Bring Your Own Device” policy in 2012. The private use of social media during working hours creates headaches for employers. Younger employees like to take breaks in which they check their smart phones. Some employers categorically prohibit such activities during working hours, while others allow the use within reasonable bounds. The real problematic employee is the addict, whose waking hours are consumed by social media or gaming. Some accept their addiction and they are resigned to marginal performance. Major train and bus accidents have drawn attention to the problem. Hacking and fraud add additional layers of complexity that require constant attention. On a positive note, the Internet has evolved into an incredibly large resource that can expand our performance substantially. Previous columns argued in favor of team work and networks to cope with the complexities of the high-tech age. 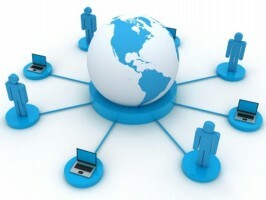 In turn, the Internet has enabled the development of devices that facilitate communication among teams and networks. The next column will describe how Twitter was used by the Boston police to catch the marathon bombers and what lessons were learned.